The Lord is breathing upon your waste places! When I was praying recently, the Lord told me He was going to show me what was coming next. Then He took me to Isaiah 51. This chapter contains too many gems to describe here, but I believe verses 1-3 in particular contain an essential prophetic word for God’s people right now. Look to the rock from which you were hewn, and to the hole of the pit from which you were dug. Look to Abraham your father, and to Sarah who bore you; for I called him alone, and blessed him and increased him” (Isaiah 51:1-2). First, this word is for people who are already devoted followers and servants of Christ. Many of you have gotten so busy with certain things that you have drifted away from your original purpose. This drifting may be slight or it may be severe. Either way, it’s time to re-calibrate. I believe the Lord is asking each of us to review and return to our original call. It’s time to eschew busy work that produces no fruit. Strip yourself of things that God has not called you to do–especially things you have been doing only to please others. As you do, review the things that make you YOU. What was your original call? What are the greatest passions of your heart? What have you been feeling Holy Spirit urging you to do–but you’ve been too intimidated, uncertain, or fearful to try? When you re-calibrate yourself, don’t be concerned if you find yourself alone. Go OUT from his family. Go out from his father’s house. Go out from a familiar country. Abraham had to leave all these things in order to arrive at the place God had for him. You will have to leave some things behind as well. However, it is in that place of total abandon to God that He can bless and increase you. Many of you have been waiting for the transition to be easy before you try to cross over. You have been too fearful to take the plunge without an easy, risk-free door opening in front of you. If that’s you, I believe the Lord wants you to know that following His glory is always a risk. However, if you will follow, you will immediately see the Red Sea parting before you. The Lord will bless and increase you IN the new place of risk–not before. The Promised Land is a land flowing with favor. It flows with milk and honey. All Egypt provided was a temporary place to stay, plus provision for the journey out. Be grateful for Egypt, but go ahead and start the journey toward the Promised Land. Don’t wait for the crossing to get easier or even look easier. Just follow the Lord, and He will open the doors! Related: The Parting of the Red Sea Is Coming! The Lord is breathing upon your waste places right now. He will make her wilderness like Eden, and her desert like the garden of the Lord; joy and gladness will be found in it, thanksgiving and the voice of melody” (Isaiah 51:3). The word “comfort” in Isaiah 51:3 literally means “to breathe strongly upon” (Strong’s Concordance, Hebrew word #5162). God is saying here that He is going to breathe strongly upon all your waste places, turning what has been your wilderness into a place of pleasure and delight. Which fields in your life have become desolate? What parts of your heart or ministry used to feel well-watered, but have become nothing but dry? THOSE are the places our Father is beginning to breathe upon now. The Lord is now breathing upon all of your dead, barren places. As His breath hits each part of your life, you will see vibrant life emerge as if out of nothing. He is going to fill those wastelands-turned-gardens with joy, gladness, and song. The Lord has done great things for us, and we are glad” (Psalm 126:1-3). By the way, don’t be surprised if the Lord begins to download new songs into your heart during this season, even if you’ve never written songs before. 🙂 These songs may be private and special between you and Him–or they could benefit others as well. Either way, new songs always accompany a new move of God. Finally, you are entering a new season of fruitfulness. The Hebrew word for “desert” in Isaiah 51:3 means “a dark and sterile place.” When someone or something is sterile, it is unable to reproduce. However, God is breathing upon things that have formerly been sterile. Look for a sudden ability to reproduce–either spiritually or physically–to manifest in your life during this season. Personally, I am in my second trimester of pregnancy–a pregnancy that I was told would not happen. Despite the negative predictions we endured, the Lord has breathed upon our dark and sterile places so that my husband and I could produce fruit. I do not believe I am alone in this; but rather, I believe that our Father is moving largely across the Body of Christ to bring fruit where there was none before in many ways. 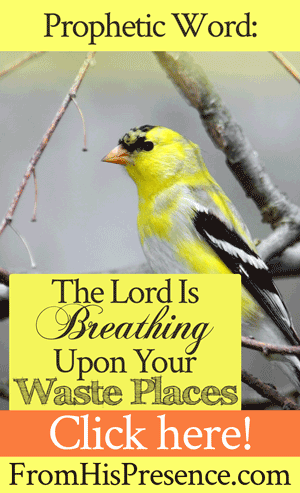 Beloved, the Lord is breathing upon your waste places. Things that used to be beautiful, but have become dry, are about to blossom. Even now, if you look, you will see green shoots beginning to emerge from the dust. Land that has become fallow will yield a harvest again. Do not fear your history. Do not think that just because something became dry and sterile means it will stay that way. The Holy Spirit–the divine Breath of Heaven–is breathing on you right now, and you are about to see a resurrection. Does this word resonate in your spirit? If so, please leave a comment below. I’d love to hear from you! Jamie, I want to thank you for this word today. I feel this is truly from God our Papa. Because I feel a change is coming to me and my family. I kept dreaming about a baby all the time. I kept seeing me with a baby. So I start asking my family was anybody pregnant and everyone said no. It was you all the time. I pray for you and the baby every night. God is so good. Baby means there is a big change coming for me and my family. You are truly an Angel sent from God to encourage his children’s. I thank you again. Thank you so so much Jamie. I don’t think you realise just how precious you are and what an impact you are making in the Kingdom of God, as well as in all of our lives, and that is all over the world! Love you! I needed this word. I’m receiving it as mine, I’m claiming it by faith because I just came out of a very long wilderness visit. Hi Jamie, I just wanted wanted to Thank You for the Prophetic Words of encouragement. I received your email just when I was feeling a little discouraged. My husband and I have really been going through with our finances. But, at that same moment God spoke to us through you . I am so grateful that God used you to encourage us. We really needed it. Thank You once again. Thank you Lord and thank you Jamie. This word is such a blessing right now to me. I decree and declare that the Lord is really and truly breathing upon my waste places in this season. Thank you Lord. And Jamie I thank God for your life and what you are doing may father God continue to bless the works of your hands and I pray for your baby to be in good health and all when he/she arrives. God bless. Amen. PTL ? And may God bless you abundantly Jamie ? 98% overlap with my life now and maybe more so my wife. Isn’t that awesome? God is too good. Way to go Jamie! Yes! Thank you Abba Father!! Thank you Jamie for bringing this true, deep and real word to me today! I receive it and look forward with serious eager anticipation to what He is going to cause to spring to life and to resurrect. The Lord bless you Jamie – big time!! Dear Jamie, thank you so much for your ministry. Thank you for this word of encouragement. I’m certain the Holy Spirit is speaking to me through you. “The Lord bless you, your husband and your baby and watch, guard and keep you; The Lord make His face to shine upon and enlighten you and be gracious (kind, merciful and giving favour) to you; the Lord lift up His (approving) countenance upon you and give you peace, (tranquility of heart and life continually). Num 6.24-26 AMP. Love, Denise in Sydney, Australia. I humbly receive this word from the Lord. Three words: Oh. My. Goodness. Thank you Lord and thank you Jamie for the sharing the prophetic words that the Lord gave you. The Lord Jesus has breathed his sweet breath on me and unexpected things are happening in my life. 1. I saw many many open doors in my dream. 2. I saw a hill with green grass and snow. Yes, God is moving me out like Abraham. You always speak right to the depths of my heart! Thank you! Thanks for the awakening,God bless you. Thank you Jesus for your comforting word, thank you for the wisdom and understanding you’ve given Jamie that she may bring to us exactly what we needed. Jamie this word came at the right time, im at the point where my life feels like a waste and dry land. 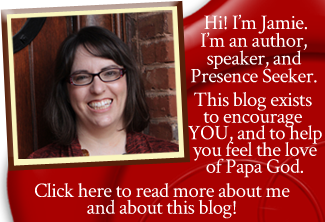 Jamie, I’m new to your blog and community, but I must say that I am so EXCITED to have found you. Your prophetic messages and blogs speak straight to my heart ❤️. I am asking you and this entire community to pray for me as I step out in faith as a Whistleblower to reveal gross injustices in my workplace. It’s a tough battle with lots of spiritual warfare but I am a Warlord for Christ. Thanks in advance ?? Jamie, I thank you for that word it was greatly needed, God is beginning to do a new thing in my spirit, breathing on those dry places in my life. Refresh me in His word and given me thirsty and desire for His word so much that I must read it day and night fallen the sleep with his word. It’s as if my whole body is been renew. In my sleep I am unable to explain, it as if I am sleep and awake and God spirit is renew me for about three or four hours and I awake full of energy not tried hard to explain like his word is washing over me. I thank you so much. I pray that God will continue to use you and bless you greatly. On time word! May God continue to use you in a mighty way??? Congratulations! God is good! Loving this word today. This week I received the word re-calibrate and you mentioned it today. Great confirmation as always. Isaiah 51:3 is going up over my mirror today. ? Jesus breathe upon us. Open up the flood gates. Send us you blessings. We need you. Jamie, thank you for listening to the Lord and walking so closely with Him. My family has been in “The Wilderness” as we call it for about 13 years now. I’ve felt Papa’s stirring that change was coming, but was almost afraid to let hope arise. This word was confirmation. Thank you, Papa, for Your love and faithfulness. May God bless your family richly, Jamie. This word is for me… im in a plc where God has opened a job for hubby overseas… he just left today. But im yet to believe if God wants me there with him cos of marriage and trust issues. But then i read this post. It has encouraged me but i need prayer to start believing God is working things out. I just need a renewed confidence and faith cos the enemy is trying to steal my joy by making me doubt God. Thank you so much for this word and God bless you and keep you and your loved ones. Pls pray i have confidence in the Lord. … pls…i suffer from bouts of depression so i get discouraged quickly. Lots and lots of love ??? I came across your Word from the Lord and it hit my spirit with tremendous force! It was as if you were here with me during my devotion with my heavenly Father. This is the season I am in and I have been praying for God to build the old waste places in my life and to uproot everything that has been planted in my life that the Great I Am did not plant. God bless you and your family as we welcome the winds of change and a fresh breath of life from Holy Spirit. Amen I receive in Jesus name!!! Thanks for your obedience in sharing this. Praise the Lord, this speaks to me regarding a decision I have to make. thanks for the word iam struggling to in prayer and telling my mind that my situation will soon be good again like before. Thank you sister Jamie, these words you’ve put down here are truly from God to you for His people. I read it and I re-read it over and over. I am convinced that they are particularly for me. Our God has used you to pass across to me His soothing comforting words. May God bless you and yours. Glory be to the name our our Lord and savior Jesus Christ. Amen. I have Isaiah 51:3 on my mirror and confess it every day. This is just a confirmation of the Word. Thank you so much for sharing. Yes, I believe those God is breathing strongly upon the dry places and they will become like the Garden of Eden.